The Human Resources Guide Update Addendum is an attachment template you use when making updates to your Human Resources manual. contracts has actually saved my business ... in the beginning I did not have a clue about contracts until finding this product. Excellent for any business just starting out to use." This Human Resources Guide Update Addendum is included in editable Word format that can be customized in Word or by using the included Wizard software. How do you write a Human Resources Guide Update Addendum document? Addendum Effective Date: Current Date. By signator, authorized signature or signer. Job title of signator, authorized signature or signer. Date when the contact was signed. 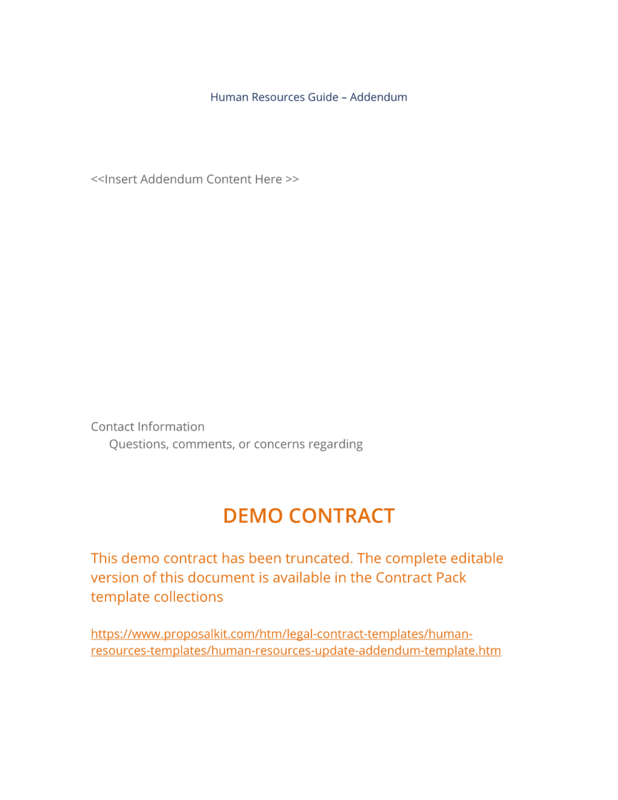 The complete Human Resources Guide Update Addendum - with the actual formatting and layout - is available in this Contract Pack.